An image art piece in-process, of the Comerica Tower. Hella lot of billboards there and bloomin windows. This is the first experiment in using our photos directly to lightbox some of the more time-consuming shots of the city. It came to me that, although I can render this stuff by hand, without question, why waste time inefficiently when I can utilize our own photos and compositions to render some parts of the city quickly and accurately (all character illustrations I do by hand though. I'm only utilizing this process with architecture). With this in mind I thought I'd try doing some blow ups of some of the photos and lightboxing the images for the base illustrations. In essence I'm treating these images as filmmakers treat a matt painting in a live action film. 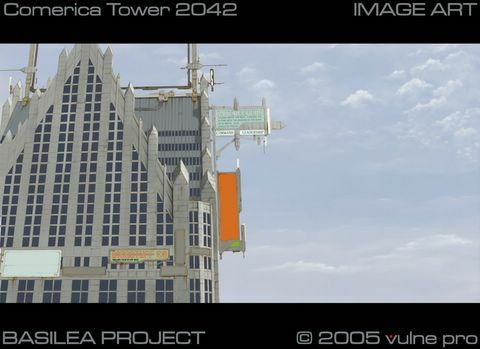 The base elements of the image, Comerica Tower, are the real location but then I have to add everything fictional that isn't there, all the 2042 stuff. There will be 3 floating police cars in the final image as well, cell shaded. So as much as this is a time saver it's still tedious and a lot of work either way. It's an enjoyable approach though and in the end this is about selling ideas not technique or process.